While traveling in Colorado we came upon this beautiful little town called Cuchara that was high in the mountains. There were several small resorts in the area as well as some local businesses. Judging by the number of people we saw coming and going from The Dog Bar it must be one of the most popular spots in town. Take time today to enjoy things and people you like. Interestingly named bar !! As long as they don't have them on the menu the name is OK with me..... Interesting find ! 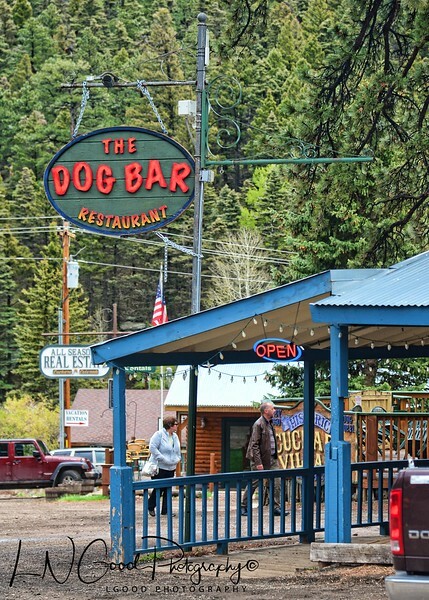 Great find and a superb capture of The Dog Bar. I would echo Sheryl Lee's quote, I'd love to go back and see small towns like Cuchara. Great photo. Great shot of this small town dining spot. Looks like it would be a great place for a snack. Excellent! Looks like a fun place to visit! Sweet shot Linda and LOL on the Name! Love the picture and title. Very cool on the cork board you have at home!